These workshops are for everyone who would like to spend time to learn the basics of watercolor painting and pencil drawing. These are skills-based workshops, and less about concepts and ideas. Who can be participants? Anyone from 7 years old or older. Exercises and projects will be adjusted to age and capabilities of the individual. As long as you have the interest to learn about these things, it’s going to be a breeze. Please, don’t force anyone or be forced to do anything that’s not wanted, it will only lead to resentment and unhappiness, and no one wants that. But I digress. The fee will only include materials. Just bring yourself… and snacks for yourself. At the end of the workshop period, around mid-May, there will be an exhibit of selected works of participants at the Art Gallery and Komiks Museum we are in the process of putting up. Details will be announced later. We will touch on the Elements and Principles of Art by way of introduction. Exercises will include the Color Wheel (Nobody can escape it! ); color properties; color schemes; and, a variety of techniques to achieve various textures and moods. Like in the above workshop, we will begin with the Elements and Principles of Art. Exercises will include freehand line drawing (boring, I know, but necessary); tonal gradation charts using pencils in varying softness; light, shade, shadow, reflective light; and, rendering of different materials of varying textures and shapes. An overview of Elements and Principles of Art to help with a simple design for cutting. Tips on making a design to be used for paper cutting. Tips on how to cut paper (Yes! There are techniques to make your life easier and high blood pressure lower.) Mounting of the artwork on a display board. Age requirement: at least 13 years old because there will be sharp objects involved. An overview of Elements and Principles of art to help with composition. We will make a simple 10-page 6”x6” scrapbook album for pocket-sized photos from scratch. Elements of a page as well as color schemes will be discussed. Page layout patterns will be provided as guide, and it will be up to the participants to use them or not. 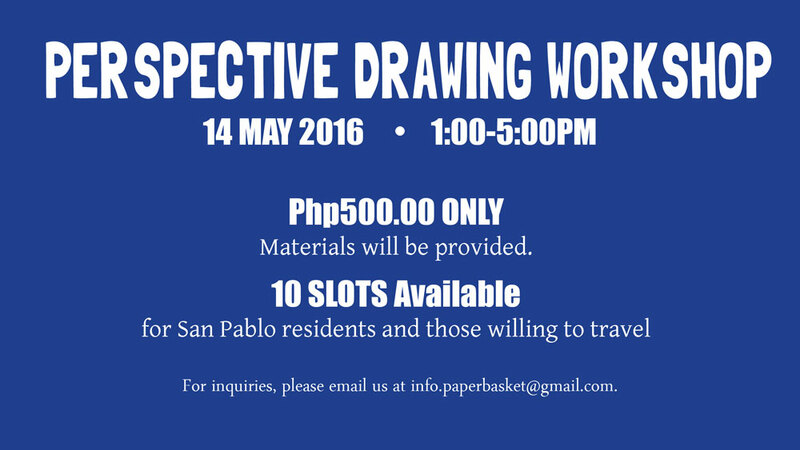 We have a Perspective Drawing Workshop coming up! We know Google SketchUp is a lot of help and by all means use it! Technology is there to make our lives easier. But sometimes, we just want to learn how to draw environments and objects in correct perspective, and apply it to our personal projects. Sometimes, there is satisfaction in doing it ourselves... from scratch. And we can do that! We are going to touch up on the concepts behind One-Point Perspective, Two-Point Perspective, and Three-Point Perspective. We will discuss the technical version (a little) and the guesswork version (a lot). We will have a few smaller exercises, and a final drawing output (hopefully) by the end of the workshop. When you sign up, you could tell us the reason for it, so we could adjust the lecture and the exercises to your needs. This will be limited to 10 participants only so we could have more time with each other, than if the class size is bigger. The workshop fee include all materials that you could need during the session. However, it does not include food, so bring your own snacks. 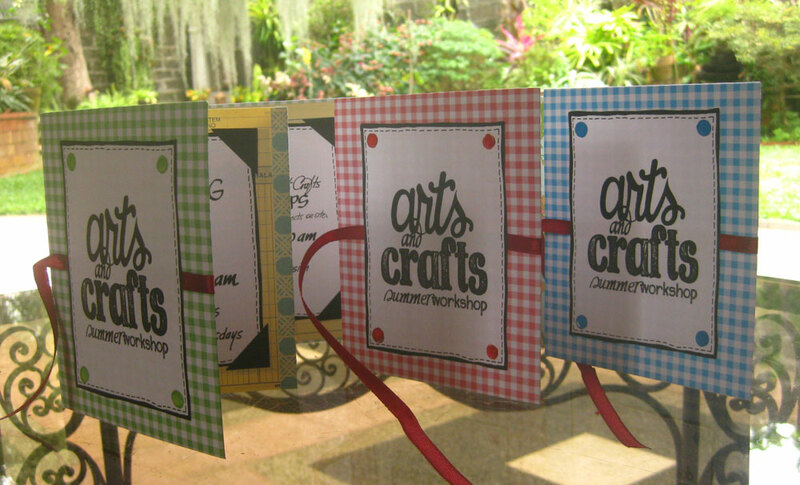 We offer customized handmade papercraft products such as greeting cards, scrapbook albums, mini-albums, blank journals, calligraphy work, boxes, scrapbooking services and other papercrafts. Ms. Ilyn is a licensed architect who decided that teaching arts and crafts, or making them, is way more fulfilling than dealing with contract documents, estimates and technical specifications. She taught Architectural Drafting and Painting to High School Students for five years, and Arts for Pre-K to Grade 3 Pupils for three years. "... For it is not the thing done which is beautiful but the doing. If we appreciate the thing, it is because we relive the heady freedom of making it. Beauty is the by-product of interest and pleasure in the choice of action."